In the first meditation of this program, you'll focus on practicing the basics and relaxing into accepting the things in life that you cannot control. Very annoying and distracting background music. The guided meditation would have been fine if not for the music. anything good to say. And I can't delete the whole thing from my computer. Great way to start meditation. Content is well organized and scaffolded. Narrator's comments and vocal quality are very soothing. 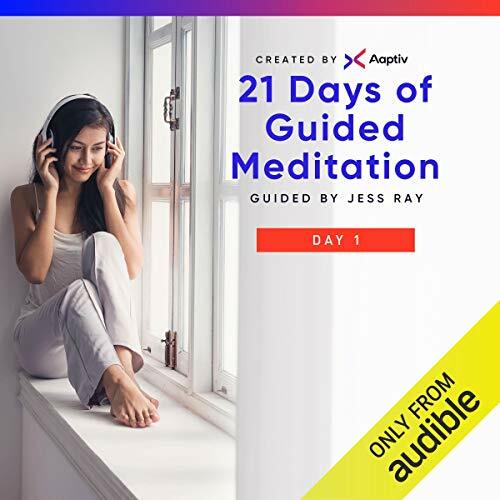 Highly recommend it for people looking to start meditation, or are busy and need on-the-go moments of stillness to readjust. This recording had so much talking and music going on, I can't recommend it for meditation. The meditation sessions were also incredibly short (10 minutes) when research suggests that a minimum of 15 minutes is needed for there to be effect. This was truly relaxing! I was positively surprised, as this was my first attempt ever at meditation. Better than I'd expected! Poor choice of mantras, too much talking while trying to meditate, and very unhelpful guide to meditation. Look somewhere else. I've already deleted from my library. She talks the whole time and her voice is more preppy than soothing. Not a fan. The narrator voices are SO annoying. I know this is a matter off personal taste, but I found the narrator's voice is SO annoying, SO much that I was irritated and not at all relaxed by the experience. Shame she was SO excited to have me join her on the experience. I will not be.